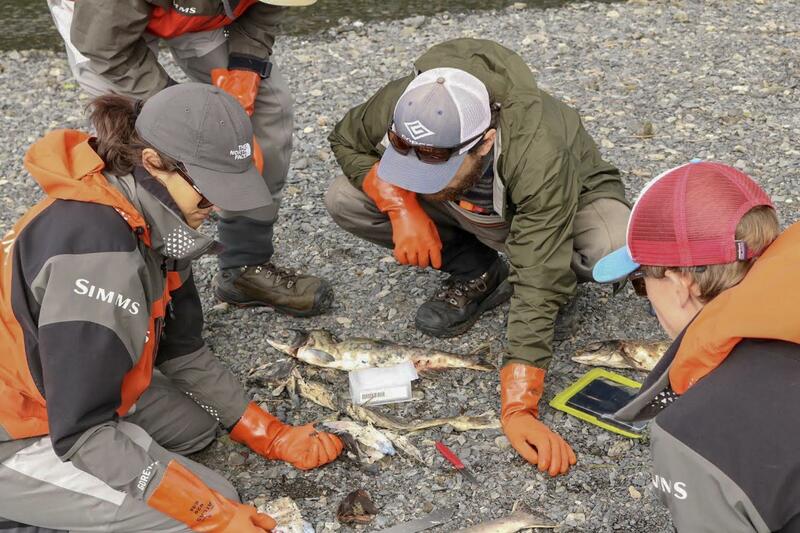 A group of researchers from the Prince William Sound Science Center sample pink salmon carcasses near Cordova as part of Fish and Game's Alaska Hatchery Research Project. The Alaska Department of Fish and Game says its massive hatchery-wild research study will inform the conversations surrounding the rates at which hatchery pink and chum salmon stray into wild streams and whether they’re less productive than their wild counterparts. The Alaska Board of Fisheries will host a committee meeting Friday on Alaska’s salmon hatchery program. The gathering is meant to be a forum to discuss the latest research and developments in the hatchery industry. That information is supposed to inform stakeholders, board members and department staffs’ understanding of the issues surrounding salmon hatcheries. But the conversation is about more than just science and statistics. After about five years of work, the Alaska Department of Fish and Game’s hatchery-wild study is beginning to answer crucial questions: do hatchery pink salmon produce fewer offspring compared to their wild counterparts and do they affect the productivity of the wild stocks they spawn with?